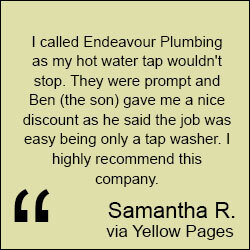 Endeavour Plumbing operates its services throughout the Elsternwick area. We have over 40 years of experience in the business and have all the tools and equipment to take care of any plumbing task no matter how big or small it may be. Our services extend from pipe laying, to leak repairs, blocked drainage, and of course, general plumbing requirements. In the past we have worked with a variety of clients from different industry backgrounds; whether you are seeking assistance in a commercial establishment, corporate office, or in your home, we can handle each setting accordingly, utilising the techniques needed. Our customer service techniques are unlike any other. We place a great priority on the satisfaction of our clients. In every job that we accept, we make every effort to work as efficiently as possible and exceed the expectations set out by our customers. We have a well trained group of staff that is well versed in every aspect of the plumbing industry; they will be able to answer all of your questions with ease and address any concerns you may have. Furthermore, our customer service is enhanced by our professionalism and integrity when conducting business. Our prices are always geared toward ensuring the highest possible quality for an affordable value. Plumbing systems are used on a daily basis, in all types of establishments, and for this reason their upkeep is essential. Most notably, emergencies with plumbing typically occur at inconvenient moments, our plumbers are available 24 hours a day and seven days a week, so you can rest assured that no matter when your emergency takes place, we will be ready to assist you straight away. If you are in need of plumbing services in the Elsternwick area whether it be for emergency assistance or routine maintenance, contact us through our contact page or by giving us a call; one of our plumbers will be able to assist you.